This year The Hillsboro FFA chapter did our annual Christmas Adopt-A-Family a little different. Instead of getting two or three families to adopt, they decided to help several kids in need within the school district. There were a total of 152 students that the Hillsboro FFA helped. These students received hats and gloves as a Christmas gift. All the students in the FFA classes took a full day to get involved and help wrap all the hats and gloves. “It’s really great to be able to be involved and help the kids in need in our own community,” said FFA member Kelcie Thornburgh. The money used to purchase the hats and gloves was purchased the annual FFA 5K held in October. This year it raised $915. Every year the kids in the FFA Chapter look forward to having this fundraiser in order to be able to help families and make sure they have a merry Christmas. 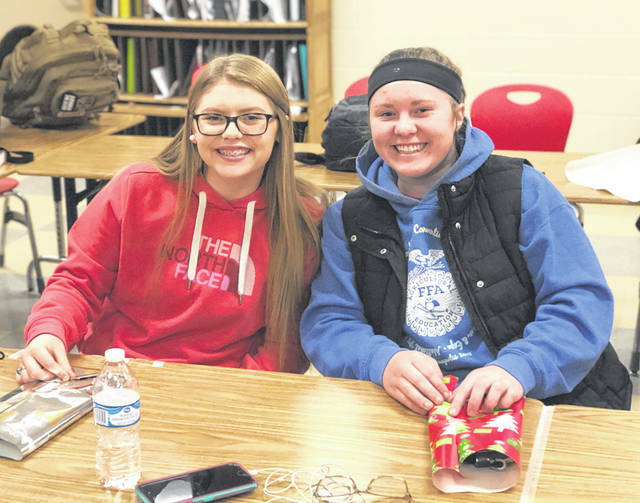 In the picture, Hillsboro FFA members Kelcie Thornburg and Mallory Parsons wrap gifts.